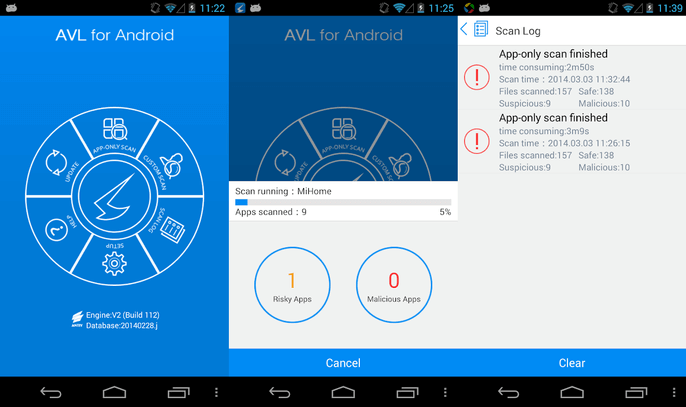 One of the most popular antivirus for Android, AVL is our number one choice for a simple reason. Yes, it is an excellent protection service, but what sets it apart is the low impact it has on device resources. This is an important factor for two reasons. Firstly, users want to keep their smartphones protected, but they don’t want CPU load and RAM to be overtaxed. Secondly, many users run lower-end devices, so need antivirus that does not take too many system resources or consumes battery life. 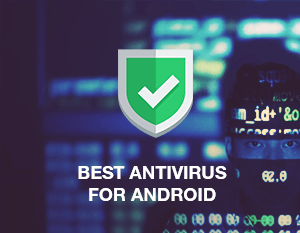 AVL has previously been named the best free antivirus for Android by AV-Test. It is a feature-rich antivirus database. The protection level is high, including an ability to detect executable files attempting to access a device. Among the other available tools include a phone blocking solution for stopping unwanted numbers from contacting you. One downside of AVL antivirus for Android is perhaps it is too eager to please. That means the application will throw up too many false positives. Of course, we want our handsets to be fully protected, but we would like to see AVL be more intelligent in how it flags threats. Avast is of course one of the leading antivirus providers on PC desktop, and the company has successfully turned its expertise toward mobile. The result is a typically excellent service that provides immense levels of protection for your Android device. 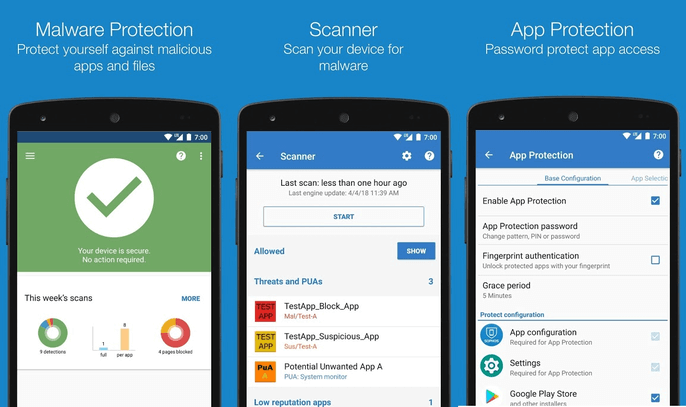 This truly is a comprehensive Antivirus for Android with a full suite of features that offers a general all-round level of device protection. 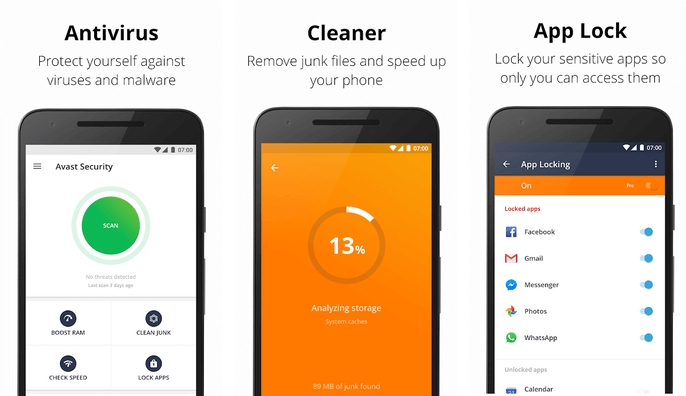 Avast Mobile Security comes with some good features as standard, including firewall protection and a call blocker. One of the most interesting tools is an anti-theft feature so you can lock a device remotely if it is missing or stolen. In-app locking is also worth discussion as it allows a PIN to be set up for opening certain applications. Avast’s Android antivirus has been available for some time, but it used to be a paid application. The company decided to make it a freemium service which is supported by ads. We don’t like ads, but appreciate that this robust suite is now available for no cost. If you can’t stand ads, you can pay a monthly fee to remove them. Like Avast, Bitdefender is one of the leaders in the desktop antivirus sector but has transitioned well to the mobile space. 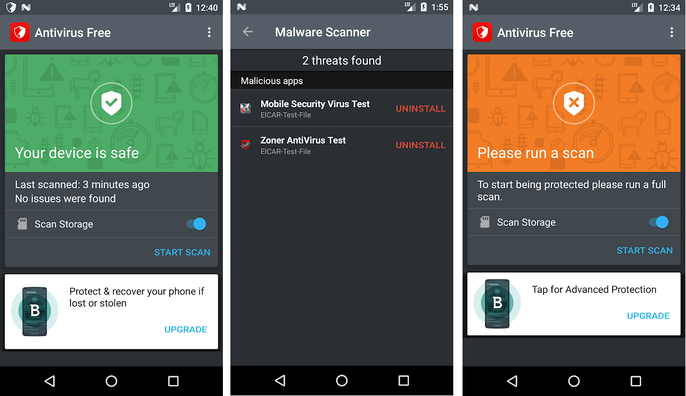 As for this antivirus for Android, the service mirrors AVL in offering an extremely lightweight experience that will not be too much of a hog on CPU, RAM resources, and battery life. The main reason why Bitdefender is light is because it does not run in the background. Users with little knowledge of Android antivirus will be happy with Bitdefender as it works from download, with no configuration necessary. The Privacy Advisor is a handy tool that provides outgoing protection to smartwatches to notify users when they leave a device somewhere. People who forget where their smartphone is will certainly appreciate this ability. While Bitdefender is excellent, it comes with some caveats. The first is the light nature of the service comes at a cost; namely, there is no real-time protection. Basically the app does not run in the background, meaning you have to schedule scans. Another problem is features like anti-theft are not included in this app. They are, however, available in the Bitdefender Mobile Security suite, which is a paid application. Kaspersky is another service that made its name as a PC solution, but the Russian company is also a major name in the internet security business overall. 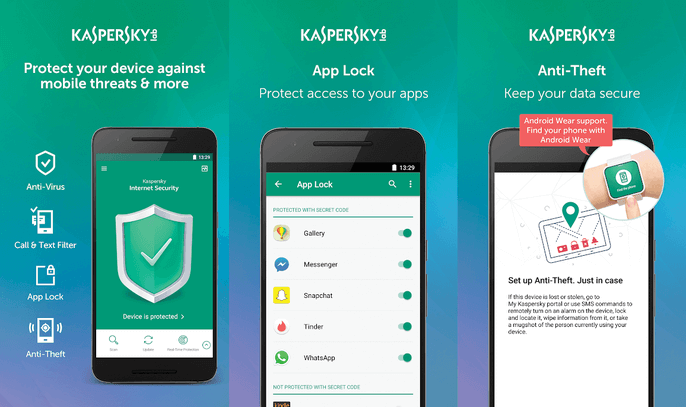 On mobile, Kaspersky has delivered a consistent Android antivirus experience that we found excelled in one particular area compared to its competitors. Specifically, this is one of the best Android antivirusat detecting malware and cleaning it up. In fact, the detection and success rate for finding malware was recorded at 99.9% by AV-Test in 2017. This basically means your Android device will be protected from most kinds of attack. Kaspersky is also quick to update its software to deal with new threats that emerge as zero-day hacks. We like the integration with Android Wear, which allows using the app remotely easier to do. However, many core features that would be free in other apps are hidden behind a subscription paywall here, which is a shame. Sophos is one of the best free antivirus for Android tablets and smartphones that does not include any advertising. It is also immensely powerful, winning the AV-Test awards’ “Best Android Security 2016” and “Best Protection 2015.” It is also a feature-rich tool that comes with several interesting additions to prevent infection. For example, Sophos blocks any website it deems to have spam or illegal content, as well as potentially harmful content. It will also scan applications to find malicious content while they are being installed. The developers update the malware database each day and scans can be scheduled as well as using real-time protection. We enjoyed the password authenticator and in-built QR code scanner, which allows easy access to secure Wi-Fi connections. Like AVL, Sophos is too quick to flag perfectly good apps and content as malicious, which become frustrating when it happens frequently. Each of these five best antivirus for Android applications we selected are excellent choices for device protections. The differences in features and abilities are small, so the truth is you could choose any of the options above and be rewarded with a fantastic app that will protect your Android smartphone or tablet. This list is also not exhaustive, so check out the Google Play Store to see some other excellent antivirus solutions. Tags: Android antivirus, antivirus for Android, Avast Mobile Security 2018, AVL, best Android antivirus, best antivirus for Android, best free antivirus for Android, best free Android antivirus, Bitdefender Antivirus Free, Kaspersky Mobile Antivirus, Sophos Mobile Security.